There are not many places you can visit in Scotland that still feel like time has stood still. The little village of Culross (pronounced ‘koo-rus’) in the Kingdom of Fife is one such place, with narrow cobbled streets and charming 17th-century cottages nestled into a steep hillside by the Firth of Forth. At 5’4″ (163 cm) I felt like a giant next to the tiny front doors, and I had to fight the urge to peer into windows to catch a glimpse of history. In this town peering would be very rude, as real people live in these houses, which have been carefully restored by the National Trust for Scotland. The ‘jewel in the crown’ of this historic port town is Culross Palace, a mansion complex built by wealthy coal and salt merchant Sir George Bruce. The first house was completed in 1597, and when Sir George needed more space to accommodate all his important visitors he built the north wing (above) in 1611. Sir George Bruce was Laird of Carnock, and he made his fortune first in salt production (which involved boiling salt water in large, shallow pans to evaporate the water) and later in coal mining. He was trained as an engineer and in 1595 he established the first coal mine in the world to extend under the sea with a tunnel deep under the Firth of Forth. Sir George exported coal and salt by sea to other ports on the Forth, and to Dutch and Swedish ports as well. His ships returned with Dutch ceramic roof and floor tiles and window glass as ballast, and these were used in the construction of Culross Palace. Thanks to much painstaking restoration of the interiors, visitors can get a real sense of what life was like in the 17th century for a wealthy Scottish merchant and his family. There is wood panelling in every room, with decorative murals adorning some ceilings and walls. Because these rooms are so well preserved, several episodes of the popular television series Outlander have been filmed here. In the first series, the town is known as Cranesmuir and the Mercat Cross above (minus the modern cars) is the scene of a 17th-century witch trial. There are so many beautifully preserved buildings that I’m sure very few changes were required for filming. The Culross Town House above served originally as a court house and prison. Today it houses an exhibition gallery and gift shop. In the foreground of this photo you can see a stone plinth and a wooden post. These mark the spot where merchants brought their produce to be weighed at the Tron, the official burgh weighbeam as shown in the artist’s drawing below. You can see the Town House still under construction in 1625. The clock tower it has today was added some years later. Culross and its distinctive ochre-coloured palace are impressive enough, but even more surprising is the terraced garden that extends up the steep hill behind. This has been planted with flowers, fruit and vegetables that would have been grown in the 17th century. Thanks to a long, hot summer this year, the garden is flourishing! There are shady bowers, wooden seating, stone walls and crushed seashell paths. From the top level, visitors have a stunning view across the Firth of Forth. A small orchard has not only fruit trees but also a collection of Scots Dumpy chickens. Apparently these supply eggs for the palace cafe, where we stopped for lunch. And like everything else in this magical place, the food was outstanding! Recently my family and I had an amazing adventure on the other side of the world. We flew from Glasgow to Malaysia in the heart of Southeast Asia where the weather is always hot and steamy, even in December. From the capital city of Kuala Lumpur we took a four-hour train ride (with f-f-freezing cold air conditioning) up the coast to the island of Penang. The main city on the island is called George Town, and it has a long history as a trading port. Today the city is a modern metropolis with high-rise office blocks and fancy hotels, but there are still some beautiful historic buildings that give a sense of the old way of life in Penang. One of these is the famous Blue Mansion on Leith Street. It was built in the late 1880s by a very successful Chinese businessman and diplomat, Cheong Fatt Tze. Born into relative poverty in southern China in 1840, Cheong fled civil war and settled in Jakarta, Indonesia, where he started as a shopkeeper before building an impressive business trading rubber, tea and coffee. He had three ships which travelled between Penang and Sumatra with trade goods, and soon he was rich enough to buy a bank. Wealthy businessman Cheong Fatt Tze in the 1890s. Cheong Fatt Tze was so well known and admired in Penang that the Chinese government appointed him as Chinese Consul, responsible for the wellbeing of all Chinese residents of Malaysia and Singapore. For this highly prestigious position, Cheong decided he would need an impressive residence as his base. The Blue Mansion was built according to the principles of Feng Shui, a Chinese philosophy linking architectural design with the elements of nature to ensure a lucky and harmonious life. For example, the house has five courtyards open to the sky, allowing rain to enter, as water is a symbol of wealth and prosperity. The house is also built on a gradient which allows drainage and represents the upward steps toward progress and self-improvement. The first courtyard features an ornate Chinese screen, imported cast iron columns and railings and a granite floor. Because Cheong was an international trader, he chose the highest quality materials for his mansion from around the world. These included Victorian encaustic floor tiles from Stoke-on-Trent and decorative cast iron from William Macfarlane’s Saracen Foundry in Glasgow. A view from upstairs shows the ornate cast iron columns, railings and brackets, as well as the decorative floor tiles, all imported from the UK in the 1880s. Being a Glasgow resident myself, I couldn’t resist finding a Macfarlane imprint on one of the columns! The floor tiles are typical of the time and the same patterns can be found in Victorian houses around the UK. The exterior of the house is finished with a lime wash (mixing powdered lime – not the fruit – with sand and water) which is spread on the surface like plaster. Natural lime wash dries white, but because this colour represents death in Chinese culture, Cheong’s mansion has the addition of indigo dye which creates a beautiful blue colour. At the eaves, Chinese craftsmen have added an amazing floral decoration in the Chien Nien style with pheasants, parrots, crabs and fish. These are made with red, yellow, white and green ceramic bowls which have been broken to create curved mosaic pieces. All very labour intensive! The curved porcelain pieces make perfect feathers and flower petals. Cheong Fatt Tze had eight wives and six sons. His favourite wife (number 7) lived in the Blue Mansion, and Cheong used part of the building as his office as Chinese Consul in Penang. He died in 1916 and his will stated that the mansion must be shared by his descendants and could not be demolished or divided up. Over the years it fell into disrepair, and was eventually inhabited only by drifters and rats. The mansion also houses a luxurious 16-room hotel and a restaurant called Indigo. It’s an impressive building with so many surprising details, not least of which is the fascinating story of Cheong himself. I think if we ever go back to Malaysia it will be my hotel of choice! I will let you in on a little secret. That photo I use at the top of my blog was taken some years ago on the isle of Iona. It’s a beautiful place which I have visited several times, and each visit is special. Now you can see the whole picture, including my daughter who was about eight at the time. She is now almost twenty and a few inches taller than I am! I use another photo of Iona on my Twitter account. This one shows my son (now seventeen) walking along the road across the island to a big beach on the western side. Recently I was invited to come back to Iona as part of the Summer Gala Fun Day on the island. Apparently my puffin picture books are very popular there, so the people who run the Martyrs Bay Shop kindly asked me to do some storytelling and book signing for them. Naturally I had to accept! In the run-up to the event I was delighted to see a poster up in the shop window, kindly supplied by my publisher, Floris Books. The shop has a special puffin corner, and this was where my three puffin books were prominently displayed! On Saturday I read stories with a lovely little girl from Cork, Ireland. She was full of story ideas of her own, too! Then I spoke to a number of tourists from England, Australia and America, and signed books for all their grandchildren. On Sunday I had a very enthusiastic crowd of small children, parents, grandparents and a few dogs! We read all three books and then the children were each allowed to choose one. It was interesting to see which book appealed to which child. Some already had Harris the Hero at home, and many were surprised to hear that Lewis Clowns Around was the first book. I had a lovely time meeting people from all over the world, and I think the children enjoyed it too. The warm and friendly staff at Martyrs Bay Shop made the whole experience a great pleasure, so many thanks to all of them! In between storytelling sessions, my husband and I wandered around the island taking photos of the beautiful scenery. We walked the same road as my son to the other side of the island, and my husband actually went swimming in that clear but c-c-c-cold water! The beach was beautiful, and almost deserted. When we got back to our hotel (the Argyll) we enjoyed relaxing in the sunshine out in their garden. It looks out on the water between Iona and Mull and has lots of wooden benches bleached by the sun. Such a lovely view to look out on! It’s hard to imagine a more relaxing holiday. I do hope they’ll invite us back next year! Recently I was doing some research for a simple, non-fiction book about playgrounds (published by Cambridge University Press) and I was amazed at all the brilliant and imaginative play spaces I found. Wooden castles with giant serpents, crazy ice palaces, wild water jets and wonderful animal sculptures – there was no end to the inventive playgrounds I came across. It made me wish I were a kid again! On Wednesday 4 May, the Duchess of Cambridge will officially open a new playground at Hampton Court Palace in what used to be King Henry VIII’s tiltyard (where he held jousting tournaments). It’s called the Magic Garden, and it features bright red and blue towers (King’s and Queen’s), a moat, a secret grotto and a very scary smoke-breathing dragon! If you like the idea of climbing all over scaly monsters, here’s another surprising playground feature: a giant pike! It was designed by a Danish company called Monstrum, and stands in Annedals Park in Stockholm, Sweden. Monstrum create all sorts of amazing wooden structures for children’s playgrounds, including moon rockets, submarines, snail shells and a haunted house. The company was started by two men who were set designers and builders for Danish theatre. When one of them joined the parents’ committee of his son’s nursery to look into buying playground equipment, he realised he could design and build something much better himself. That’s how Monstrum was born. The wonky buildings in this playground in Copenhagen reflect the design of the surrounding houses in a comical and surreal way. What child could resist exploring this weird play space that includes three houses, a baker’s shop, a slide and a rope bridge? Do take a look at the Monstrum website to see the amazing designs they have built all over Europe, Scandinavia and even Russia. I wish I spoke Danish so I could work for them! Another company that makes fun wooden playground equipment (among other things) is Adirondack Storage Barns in upstate New York. The boat above is like a little Noah’s Ark, which you half expect to find full of animals in pairs. It would be great to climb inside and peek out those portholes. If you don’t fancy a boat to climb on, how about a wooden train? I can imagine all sorts of kids having fun on the train, though there might be some disputes about who is going to drive… Adirondack also make a tractor and trailer that would hold a good crowd. But not all playground equipment is made of wood. What would you think of exploring a huge amusement park made of ice? Every year in northeastern China, ice sculptors gather to create the most amazing play space for the Harbin Ice and Snow Festival. Blocks of ice are taken from the Songhua River to build impressive castles and super-fast ice slides. They look best at night when lit up by colourful lights. Looks like fun, but you’d have to bundle up! At the other extreme, when the weather is way too hot, you can always get yourself to Washington Park in Cincinnati, Ohio, where there’s a brilliant interactive water feature. Over 130 pop-up jets spray water in time to music and lights, and everyone just jumps in! The walk home would be pretty soggy, but it would be worth it! On our second day in Toronto, my son and I hopped on the Yonge Street subway line to head down to the Harbourfront area. 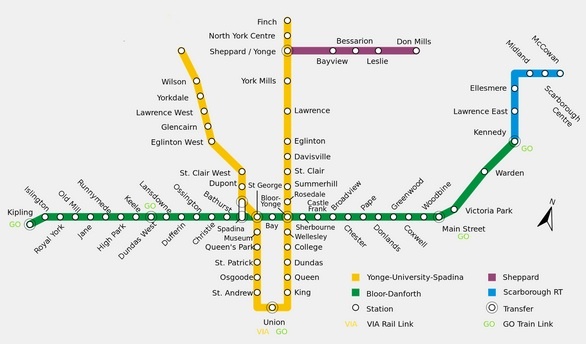 The subway system has been expanded since I lived in Toronto, and now reaches further in all directions. A good deal simpler than the London Underground system, the Toronto subway has two main lines: the yellow one goes North-South in a big U, and the green one goes East-West along Bloor Street. 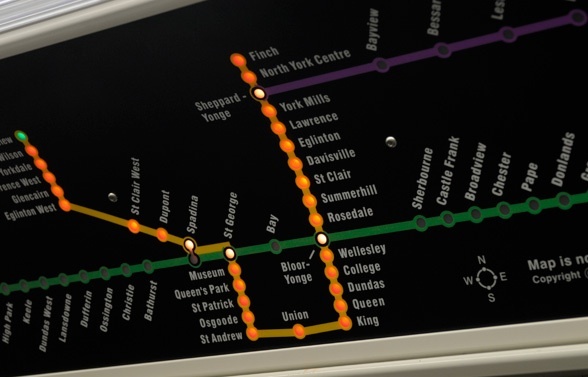 Toronto Subway map showing the three lines. Map ©TTC. The Bloor/Danforth line has been extended north at the eastern end. It ended at Kennedy when I lived there. So I see a new blue line and also a little purple one that wasn’t there before! These go out into the suburbs. Downtown Toronto is the area served by that lower part of the U. The subway trains have also changed a great deal since I was last in Toronto. 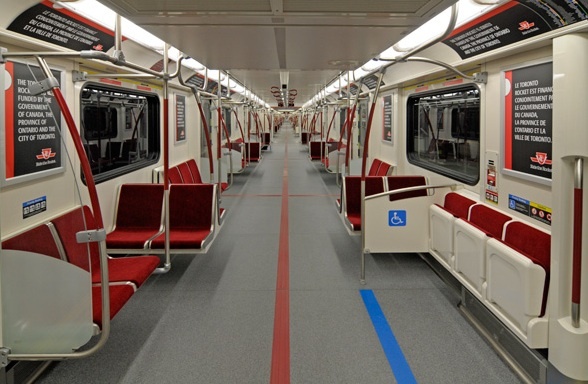 Now they are sleek and open with no divisions between carriages. They were revamped in 2010 and now look similar to New York subway trains. 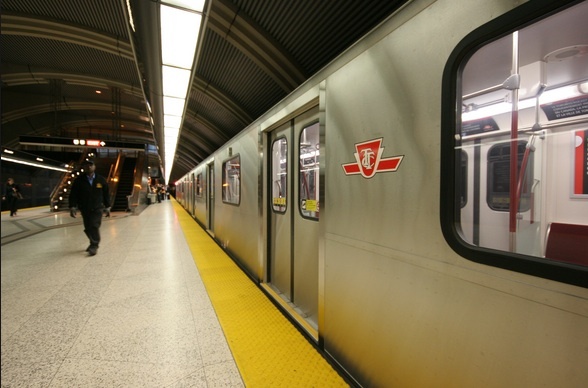 The new Toronto subway trains were launched in 2010. Photo ©TTC/Mike DeToma. The platforms are clean and modern, and signposting is pretty clear. 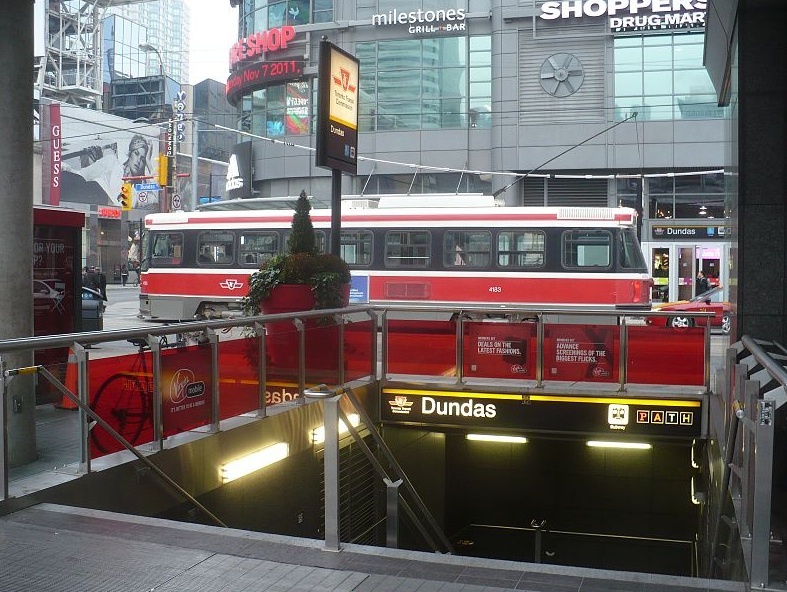 You can get a transfer to travel on a bus or streetcar once you come out of the subway, but remember to get it at the station where you start! Look for the red transfer machines. Inside, the trains look great but the seats are a bit hard. Plenty of room for standing though, and you can walk down the full length of the train. There are regular announcements at each station and a set of arrows on the overhead display shows which side to exit on. There is also a clever illuminated map of the subway network with a green light indicating the train’s current location. Red lights show the route you are on and where you will go next. So, all this to say we took a subway train down to Union Station, where we took a short walkway south to the Harbourfront. I hardly recognised the place, as so many new hotels and highrise condominiums had been built in the past 20 years! We were meeting a friend at the Queen’s Quay building, but I had some trouble finding it in a forest of glass and concrete towers. 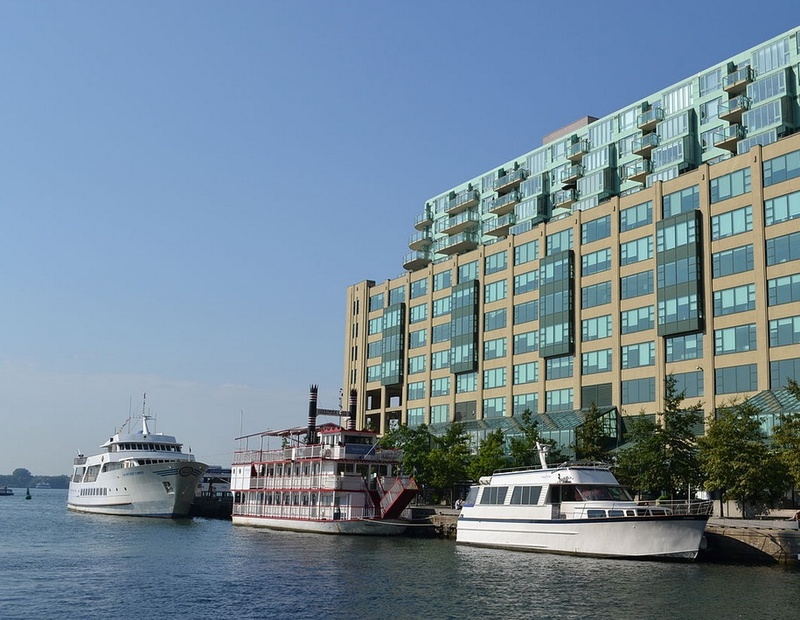 The Queen’s Quay Terminal building was originally a warehouse on the waterfront, but was converted to luxury condominiums in 1983. Back then it was virtually the only one of its kind, with lovely terrace restaurants on the quayside and a landscaped walkway behind. A nearby powerhouse was converted into an art gallery in those early days of cultural transformation. 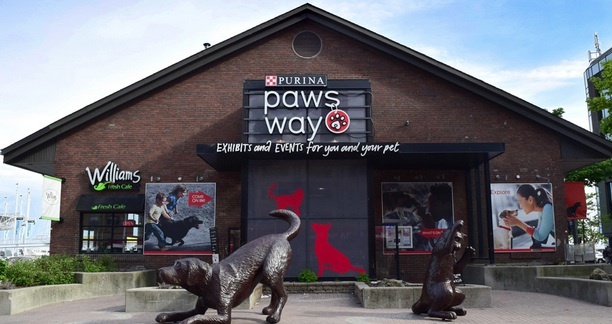 Now there are a huge number of attractions, including a dog and cat centre, the Purina PawsWay, where pets are welcome to take in exhibits (such as the Animal Hall of Fame) and events like obedience training and obstacle races. Not being pet owners, we didn’t venture in. Giant bronze pets welcome you at the PawsWay at Harbourfront. Photo ©Purina PawsWay. Instead we had a lovely walk along the waterfront and a great meal with our friend on a sunny terrace. The next stop was the CN Tower, but when we arrived it was so crowded that we would have had to wait two hours to go up, so we decided against it. My son had forgotten his glasses anyway, so Toronto from the air would have been a blur! We decided to stroll up Yonge Street, the longest street in Canada at 58 km. We had only travelled a few blocks when we came past the Elgin and Winter Garden Theatre, a handsome Edwardian double theatre built in 1913 by Marcus Loew and designed by Thomas W. Lamb. Photo ©Elgin Winter Garden Theatre. Originally designed for vaudeville, the lower Elgin Theatre was a sumptuous gilt and red velvet hall where silent films were introduced, and later it was adapted as a mainstream movie house. 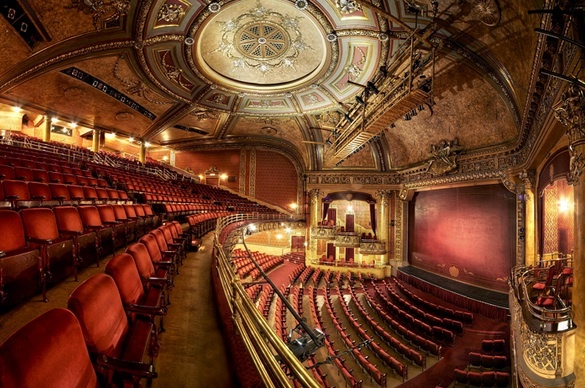 The Elgin Theatre has been in continuous use since 1913. Photo ©Elgin and Winter Garden Theatres. 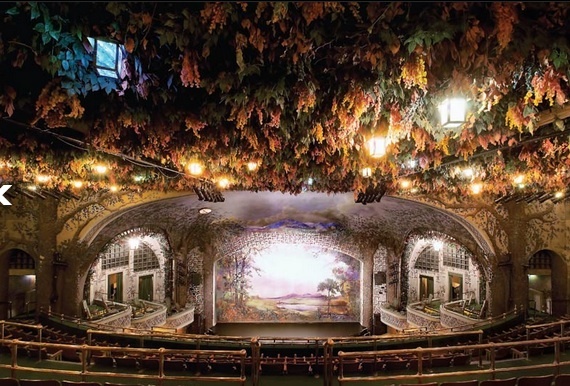 The separate Winter Garden Theatre is located seven stories above the Elgin, and is a whimsical creation with its hanging beech branches and twinkling lanterns. 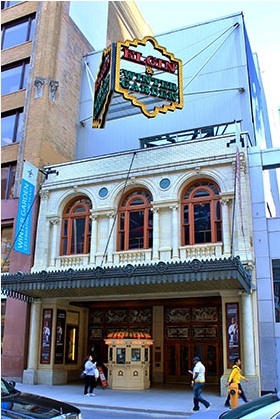 The unique Winter Garden Theatre has tree-like columns and hanging leaves. This theatre was aimed at a more discriminating audience but it also featured vaudeville shows. 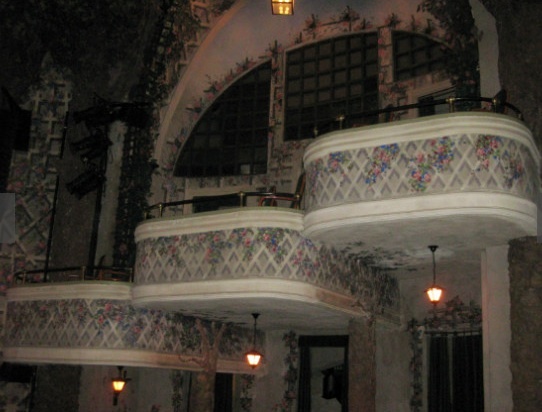 When these declined in popularity the Winter Garden Theatre closed, and lay unused for 65 years. 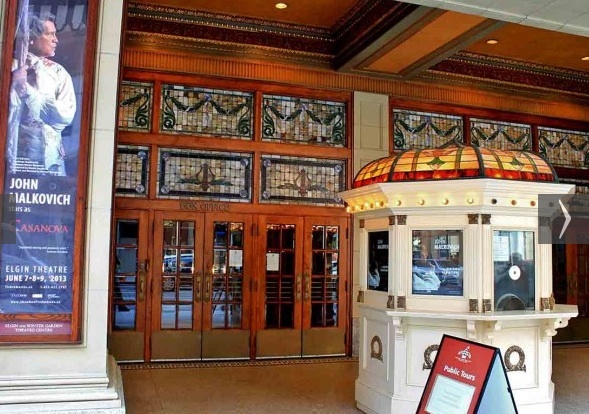 In the 1980s both theatres were restored by the Ontario Heritage Foundation. In the upper theatre, volunteers spent many months rolling the painted walls and boxes with raw bread dough to remove the soot. This was the only way to clean them as they were painted with simple water-based paints. The boxes and stage surround are painted with trellis and roses. We had intended only to pop in and look at the lobby with its lovely stained glass doors, but we ended up going on a 90-minute tour! A very lucky discovery, and much more interesting than the CN Tower, as it turned out. The entrance to the Elgin, with beautiful stained glass doors. Photo ©Elgin and Winter Garden Theatres. There is so much more to see in Toronto that we must try to get back very soon. I’m going to make a list and be a bit more organised next time!